I had a bunch of Rowan Calmer left over after I had Jillay's ear warmer, and I was trying to decide what to do with it. 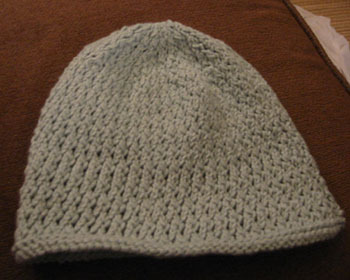 I remembered that Alison had made a chemo cap out of a Calmer pattern, so I asked her to loan it to me. She did, and I made good progress on the cap before leaving to go on my trip. I figured that she could wear the hat alone, or with the ear-warmer when it gets cold. Let me clarify. I have a freakishly large head, so I asked my mom to try it as well. Too big for her, too. I started ripping. I made some progress over the next 12 hours, but couldn't get it all done. Grudgingly, I brought it back to Massachusetts to finish, and promised that I would give it to her when I saw her over Thanksgiving. It's all done now, and you can still see that it looks small on my freakishly large head. I hate being late for birthdays. Harrumph.